To add or edit users in Project Insight, you must be a System Administrator or a User Manager. This will display a list of the existing users in the system and also expand out the Users sub-menu options in the left navigation. To quickly add a new user, click in the Users menu options in the left navigation. Click on the Add User menu option. The User Add/Edit form appears. Click on the various tabs to get more information on the data that is entered on that tab. You can keep a history of when a user was added by adding the "Created Date" column in the Display Options. 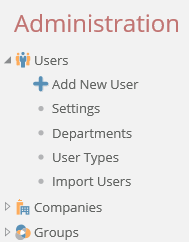 Track the Total User count at the bottom of the User Admin page to stay updated with your User breakdown. This will automatically populate the new user's settings based on the existing user's profile and display it on the Users Add/Edit form. Not all the data will be populated. You will still have to manually enter some data such as the User ID which will be unique for each user. Go through and change the data on each tab to be applicable to this user as required. By default, the users form shows all users that you have access to see. However, you can filter and search for only certain users. You can also change the Columns of Data that display. 1. Click the Display Options menu option. 1. Click on the letter corresponding to the users last name. 2. Click All to revert back to all users regardless of the letter that their last name starts with. 1. Enter the text in the Search For box. It can be the first name, the last name or a portion of it. 1. If you have a large number of users, you can limit the number which display on one page. This improves the speed of loading the page. 50 is the default but you can change that to make it bigger or smaller as required. 2. 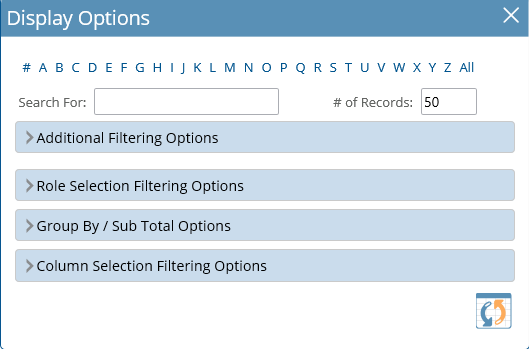 Click in the drop down for the filtering criteria you want and select it. You can select more than one option in each drop down by clicking on it. It will be moved to the right hand side of the drop down list indicating that its been selected. 2. Click in the Include only the following roles within selection checkbox to turn on the role filtering criteria. When it is checked, all the available roles will appear. Note* If you enter multiple filtering criteria, Project Insight treats it as an "AND" relationship. That is the user must meet all the criteria entered, in order to be selected. Ensure that you click back on All in the letters and remove any search terms you entered and any of the other filtering criteria that you set. Expand the filtering sections and click on the items in the right hand side of the drop down boxes to remove it. 2. Set the columns of data to display. See Page Display Options for more details. 1. You can also group the display of users. Click the Group By / Sub Total Options section to expand that out. 2. Click in the Column drop down and select the data to group by. 3. Click the + icon to add that grouping. 4. Add additional groupings if required. To Update the Display with the filters and display options, click the refresh icon. These settings will be remembered and applied automatically the next time the users list is displayed. There are two ways to Edit a User: from the User Add/Edit form or right on the user list (although only a limited set of the most commonly changed settings can be changed on the user list such as the System Roles and the Active setting). 1. 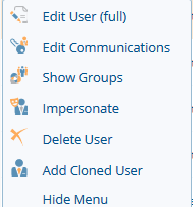 Click the Edit icon for the user (in the Admin column) or right click on the User and from the context sensitive menu options that appear, select Edit User (full). 2. The User Add/Edit form appears. Click on the various tabs to get more information on the data that is entered on that tab. From the User list, the Users personal work calendar can also be set. 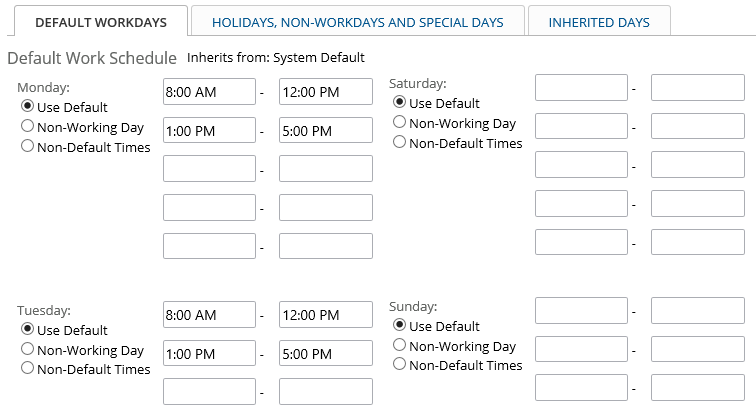 If you want to set up individual work calendars specific to each user with their specific vacation days and time-off days and use those for scheduling, you can. 2. When you created this user, you would have set the default calendar that they use. This will be displayed at the top of the work calendar add/edit form. You can then change the standards hours and add holidays, vacation days and any special working times as required. 3. Set the calendar as required. Administrators will note that they have additional capabilities within the My Insight -> My Profile settings, as opposed to non-administrative users. Additional settings to the users allow for permissions settings to content sections through user association to Groups and Companies. More global permissions settings are set through role-based permissions in the user profile.